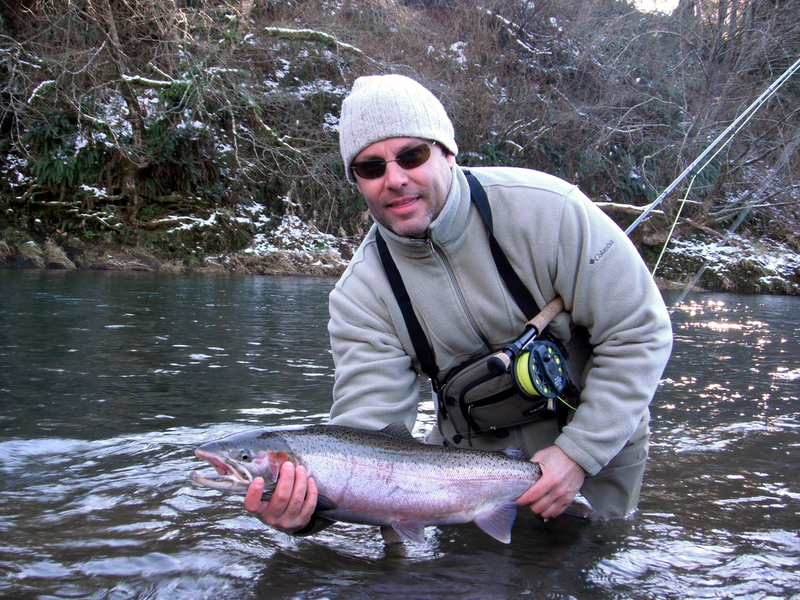 Winter steelhead fishing remains tough on the north Oregon coast. We have been catching fish, but we're working hard for each grab. Water temperatures are just under 42 degrees and will likely drop more by the end of the week. Cold water steelheading means fishing at the right depth and slowing your fly down. I always preach that your fly shouldn't be on the bottom. While this is true, it is important to know where your fly is. Using the right sink tip and a correctly weighted (or unweighted) fly is key. There is little room for error when the water is cold. Fish will move less for a fly. Slowing the fly down just means following the swing more and leading less with the rod tip. You want the fly to keep swimming slowly, but not stall out. One of my favorite rigs for cold water is a heavier tip and unweighted fly, for example a 12' T 14 tip and a rabbit strip leech. Most importantly, don't over think it. Fishing in colder water is the same as usual...it's about being in the right place at the right time. Just get into some good water and fish it the best you can.